I feel like every day I am adding a new vitamin supplement to my day’s list. In addition to all the usual suspects, I am now forever worrying about my hair and skin. 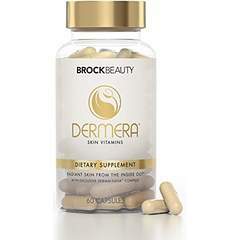 Why not try out dietary supplements from Brock Beauty that kind of fell into my product reviewing lap?!? 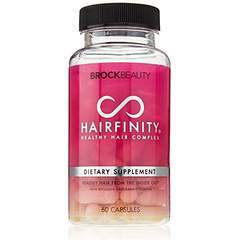 Hairfinity products are a line devoted to nourishing your hair from the inside out. Starting with these daily vitamin supplements I am on my way to a better head of hair. The recommended daily dosage is 2 per day; these are jam packed with Vitamins A, B2, B3 (Niacin my favorite! ), B6, B12C, D, Thiamin, Folic Acid, Biotin and Calcium. I literally don’t think I left anything out. Oh wait I did: this vitamin has “Capilsana Complex Blend” that has collagen, MSM and more which to me is extra “hair power”. Add in their line of hair products and their checklist/mobile app to help you on your journey and you are all set! I have been taking the vitamins a few days now and I am feeling wonderful about it! One month of the vitamins costs around $25.oo (this momma wants the botanical oil – someone tell my family). (http://www.hairfinity.com). Dermera is a true gift to my tired mommy skin. I want my glow back and I want it now. I’ve been taking these now a couple of days; 2 per day full of what my skin needs: Vitamins C, E, Biotin, Calcium and their special “Dermalsana Complex Blend” which is Protein, Aminos, MSM, Ceramide and more. I really feel like by starting with my insides, my skin will improve on the outside! These are gonna help you with dry skin as well as skin breakouts! One bottle which holds your “2 per day” will cost you around $35.00. (http://www.dermera.com/).